The Soyuz TMA-16M spacecraft delivered three crew members of the International Space Station, representing the 43rd and 44th long-duration expedition onboard the outpost. The active preparation of Soyuz TMA-16M for launch started in Baikonur at the end of November 2014. Following autonomous and integrated tests, as well as trials inside an echoless chamber, the spacecraft was stored in place until February 2015. 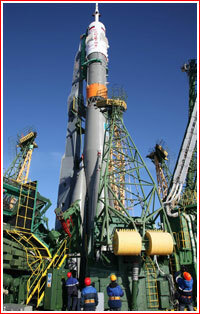 The Soyuz-FG launch vehicle for the mission arrived to the launch site on December 18. On February 16 Soyuz TMA-16M spacecraft was delivered to Site 2B, where it remained until February 24, for vacuum chamber testing. The spacecraft was then returned back to the processing facility at Site 254. The first and second stages of the Soyuz-FG launch vehicle were assembled at Site 112 on March 13, 2015. On March 24, the payload section containing the spacecraft was integrated with the launch vehicle and with its launch escape rocket. The liftoff of the Soyuz-FG rocket from Site 1 in Baikonur Cosmodrome took place as scheduled on March 27, 2015, at 22:42:57 Moscow Time (3:42 p.m. EDT). The launch vehicle lifted the 7,220-kilogram Soyuz TMA-16M spacecraft with Russian cosmonauts Mikhail Kornienko and Gennady Padalka, as well as the US astronaut Scott Kelly, bound to the International Space Station, ISS. 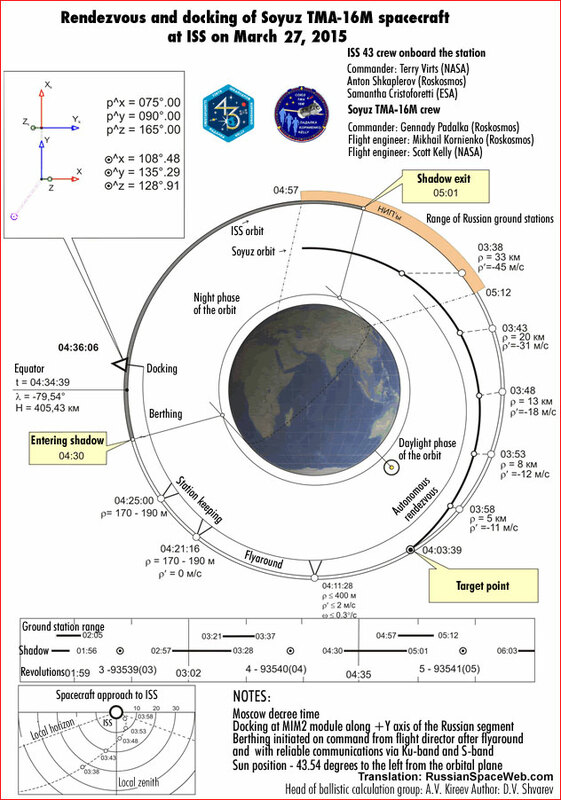 Following a standard ascent profile along the ground track matching an inclination of 51.67 degrees toward the Equator, Soyuz TMA-16M separated from the third stage of the launch vehicle at 22:51:45.26 Moscow Time into a 200 by 242-kilometer orbit. Soyuz TMA-16M followed a five-orbit, six-hour rendezvous profile, including one engine firing during the first orbit and three additional maneuvers during the second orbit to reach the vicinity of the station orbiting the Earth in a 396.86 by 421.42-kilometer orbit. The autonomous rendezvous process was to begin at 02:27 Moscow Time, leading to a final approach sequence at 04:11:28 Moscow Time on March 28, including the flyaround of the station, a station-keeping and berthing. The docking between two spacecraft was scheduled on March 28, at 04:36 Moscow Time (9:36 p.m. EDT on March 27) at the zenith-pointing MIM2 Poisk Docking Compartment on the Russian segment of the station. If everything went as scheduled, the crew would be able to board the station around 11:15 p.m. EDT, according to NASA. Padalka will land in the company of two short-term visitors to the station: an ESA astronaut Andreas Mogensen and a paying tourist Sarah Brightman, who are scheduled for launch on Sept. 1, 2015. Padalka would become the first four-time station commander and, by the end of his mission, is expected to set a record for the longest total time in space on multiple missions. In the meantime, Kornienko and Kelly will remain onboard the ISS for 342 days (around 11.5 months) and return to Earth onboard the Soyuz TMA-18M spacecraft in March 2016, in the company of the Russian cosmonaut Sergei Volkov. Doubling the duration of a typical six-month stay onboard the ISS, Kelly and Kornienko will conduct the so-called Year in Space mission, spanning from 43rd to 46th long-duration expeditions. Although, the "Year in Space" project will not break any records for flight duration and it is not directly paving the way to an expedition to Mars, it does promise NASA a unique opportunity to study effects of space on identical twins. During the flight, Scott Kelly's twin brother Mark Kelly, a former NASA astronaut, will serve as a control subject for scientists on the ground. By March 7, 2015, NASA selected a total of 10 studies in the fields of human physiology, behavioral health, microbiology and molecular science, which would compare data from the genetically-identical Kelly brothers to identify any subtle changes caused by space flight, the agency said. On August 10, 2015, two members of the Soyuz TMA-16M crew Gennady Padalka and Mikhail Kornienko were scheduled to conduct a six-hour, 28-minute spacewalk, EVA, out of the Pirs Docking Compartment on the ISS. Opening of the hatch was scheduled at 17:14 Moscow Time (9:14 a.m. Houston Time). Photographing of the European Expose-R payload and the interface on the Elektron system. According to Roskosmos, it would be the 41st EVA for the Russian ISS program and the 48th EVA out of the Russian segment of the station, when counting unscheduled operations outside the outpost. According to NASA, it was the 188th EVA in support of space station assembly and maintenance, and the 10th spacewalk for Padalka, who has spent more time in space than any other human. 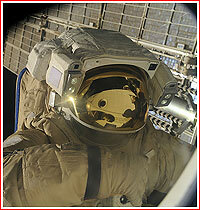 It was the second spacewalk for Kornienko, who was in the fifth month of a one-year mission on the complex. Padalka was designated extravehicular crew member 1 (EV1) and Kornienko was extravehicular crew member 2 (EV2). Both will wear Russian Orlan spacesuits bearing blue stripes. According to NASA, the actual walk started at 9:20 a.m. Houston Time. First of all, cosmonauts installed new railings for the future spacewalk. 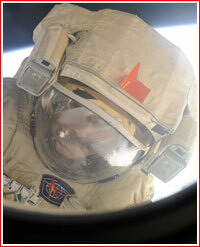 After some struggle, cosmonauts were able to clean the window on the service module. Then, the duo transferred to the aft section of the service module, where they had to make several attempts to service WAL antenna. Around an hour and a half into the spacewalk, cosmonauts removed DP-PM PVK-1 Obstanovka experiment on the exterior service module. 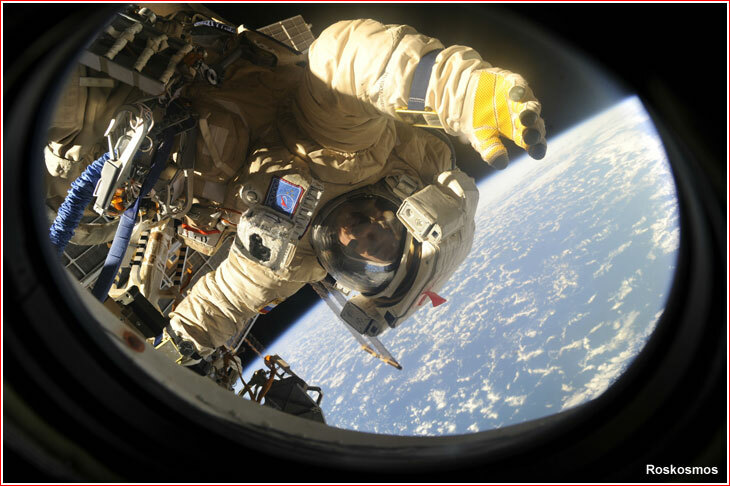 Around the same time, they finally succeeded to activate a US-supplied helmet video camera on Mikhail Kornienko's spacesuit after several failed attempts by both cosmonauts to depress the activation button on Kornienko's helmet. After completing their tasks, Padalka and Kornienko closed hatch at 2:51 p.m. Houston Time, after five hours 31 minutes outside, NASA said. On August 28, 2015, the Russian mission control planned re-docking of the Soyuz TMA-16 spacecraft from the zenith (sky-facing) docking port of the MIM2 Poisk module to the aft port of the Zvezda Service Module. According to the original schedule, the redocking was scheduled to occur in manual mode from 10:09 to 10:34 Moscow Time. The operation would free the docking port on the MIM-2 module for the arrival of the Soyuz TMA-18M spacecraft on Sept. 2, 2015. 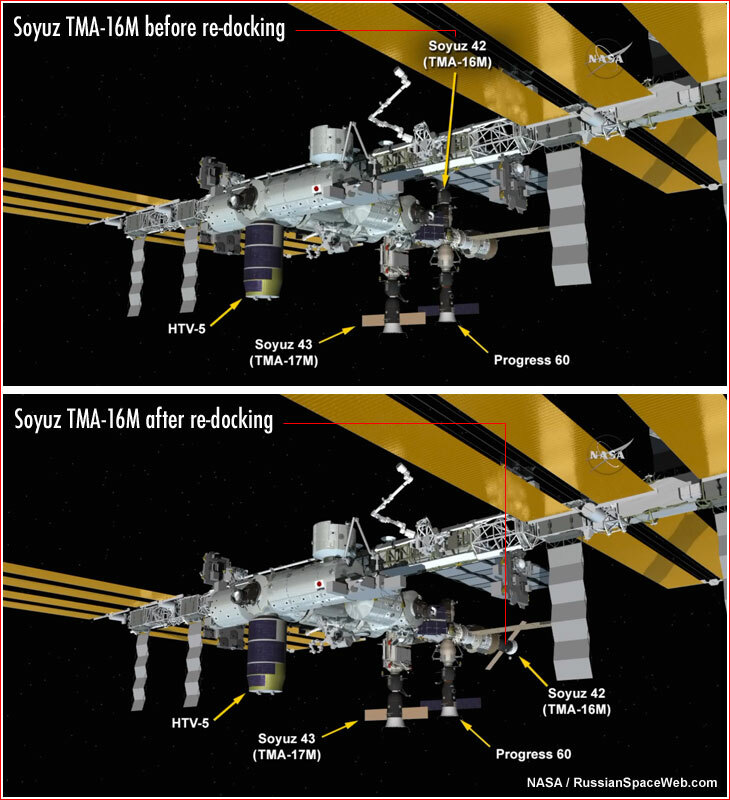 Soyuz TMA-16M would remain at its new location for only a week and a half, ultimately freeing the aft docking port on the Zvezda for future Progress cargo ships, where their propulsion systems could be fired for effective re-boosts of the ISS' orbit. 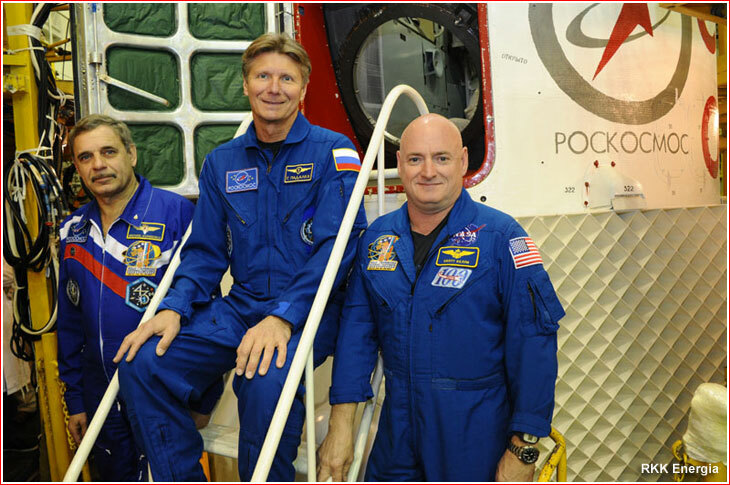 During the 25-minute free flight, commander Gennady Padalka was to pilot the Soyuz TMA-16M and his crew mates Scott Kelly and Mikhail Kornienko were to come along for the ride, just in case, the re-docking would become impossible and the spacecraft had to return back to Earth. 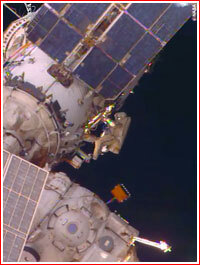 The undocking time was later adjusted to 10:12 Moscow Time (3:12 a.m. Eastern Time). The docking at the service module was rescheduled for 10:37 Moscow Time (3:37 a.m. Eastern Time). In preparation for the operation, the crew had to shift its normal sleep schedule by around five and a half hours. Hatches to Soyuz TMA-16M were closed at 11:10 p.m. Houston Time on Aug. 27, 2015. The undocking went as scheduled over Nigeria and after backing away to around 45-50 meters from the ISS, Soyuz TMA-16M extended its docking probe and began flyaround of the station. The spacecraft then successfully re-docked at the station at 2:30 a.m. Houston Time, as the outpost was flying over Northern Kazakhstan. The crew was scheduled to perform usual leak checks and re-open hatches to the station around 4:40 a.m. Houston Time (12:40 Moscow Time) on August 28, 2015, before finally going to bed, according to NASA. 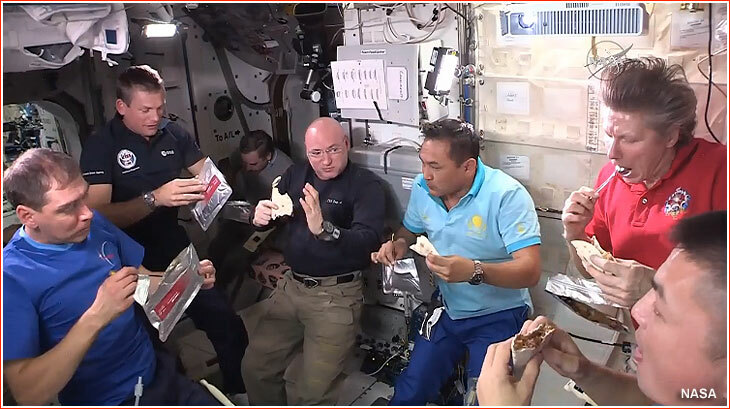 A nine-person ISS crew, including members of Soyuz TMA-16, Soyuz TMA-17 and Soyuz TMA-18M crews, shares a farewell meal before the departure of Soyuz TMA-16M on Sept. 11, 2015. Soyuz TMA-16M was scheduled to land on Sept. 12, 2015, (Moscow Time) carrying Gennady Padalka, who was launched onboard the same spacecraft, as well as Andreas Mogensen and Aidyn Aimbetov, who arrived 10 days earlier onboard Soyuz TMA-18M. During the return home, Padalka occupied the center seat of the Soyuz commander in the descent module, flanked by Mogensen in the left seat and Aimbetov on the right. Due to a last-minute switch from a six-hour to a two-day rendezvous profile with the station and resulting late arrival of the Soyuz TMA-18M, there were proposals to postpone the Soyuz TMA-16 departure until September 15, however the idea was ultimately dropped, thus shortening Mogensen's and Aimbetov's planned presence onboard the ISS. During his latest mission, Padalka spent 168 days in space and logged record-breaking 878 days in space during his five missions. Hatches between the ISS and Soyuz TMA-16M were closed at 1:17 p.m. Houston Time (2:17 p.m. EDT, 21:17 Moscow Time) on Sept. 11, 2015. 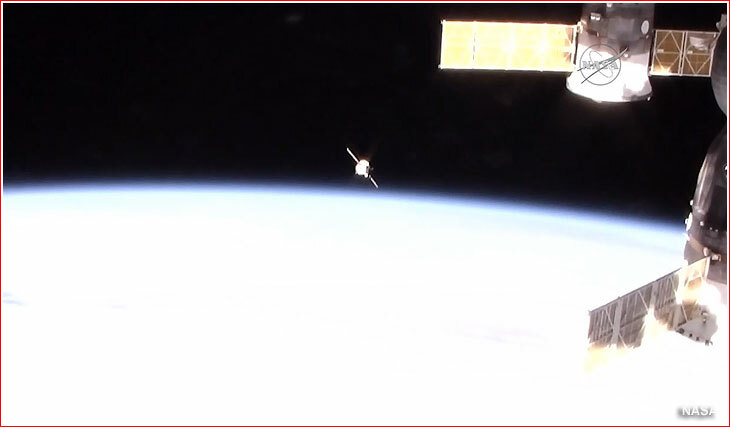 The undocking of Soyuz TMA-16M from the station's Zvezda Service Module on the Russian segment took place as scheduled on Sept. 12, 2015, at 00:29:00 Moscow Time (5:29 p.m. EDT on September 11), as the ISS was flying over Eastern Mongolia within range of Russian ground control stations. The undocking command was issued 1.5 minutes before the planned separation with spring-loaded mechanism, giving the spacecraft a speed of around 0.1 meters per second. Three minutes after leaving the station, the Soyuz made its first eight-second maneuver with its thrusters to back away from the station to a distance of around 12 kilometers for a deorbiting burn. The four-minute, 42-second braking maneuver slowing down Soyuz TMA-16M by 128 meters per second, enough to push the spacecraft off its orbit, was initiated 7:59 p.m. EDT as the two spacecraft were flying over the Southern Atlantic, off the coast of Argentina. Minutes after the successful completion of the firing, first search and rescue helicopters began taking off, NASA reported. Also, the ISS changed its attitude in space to enable remaining crew to witness and document the fiery entry of the descent module into the Earth's atmosphere. A total of 12 Mi-8 helicopters and four all-terrain vehicles were expected to participate in search and recovery operations. 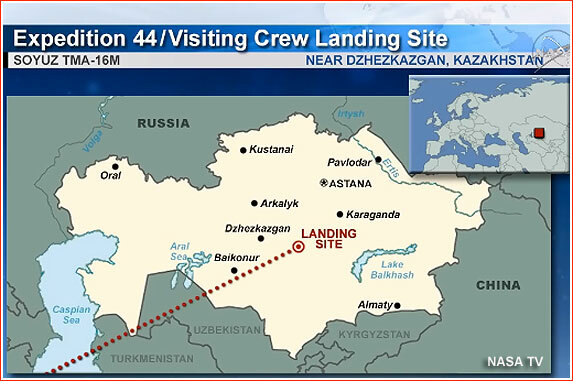 Two of the helicopters were deployed half way between the nominal landing point and the ballistic landing area, while two others were sent to Baikonur. The weather forecast for the landing area promised winds of around 7 miles per hour from northwest, temperatures around 60F degrees and overcast sky with clouds at around 10,000 feet, with chances of light rain, according to NASA. 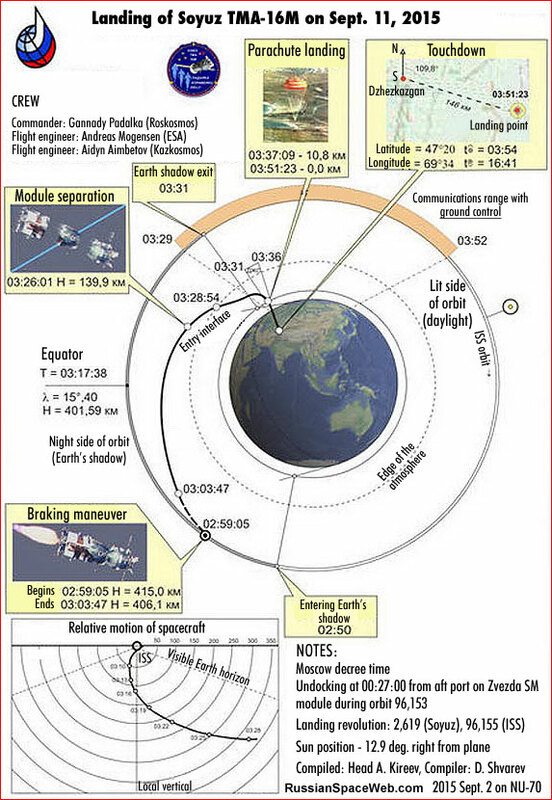 The sunrise at the landing site took place at 03:54 Moscow Time and the sunset at 16:41 Moscow Time. The descent module, SA, of Soyuz TMA-16M separated from the habitation module, BO, and the instrument compartment, PAO, at 8:25 p.m. EDT (7:25 Houston Time) on September 11. Following an aerodynamic breaking the two-tier parachute system was released from the descent module, starting with a 22-square-meter braking chute, which slowed down the capsule's descent speed from 130 meters per second to 80 meters per second. 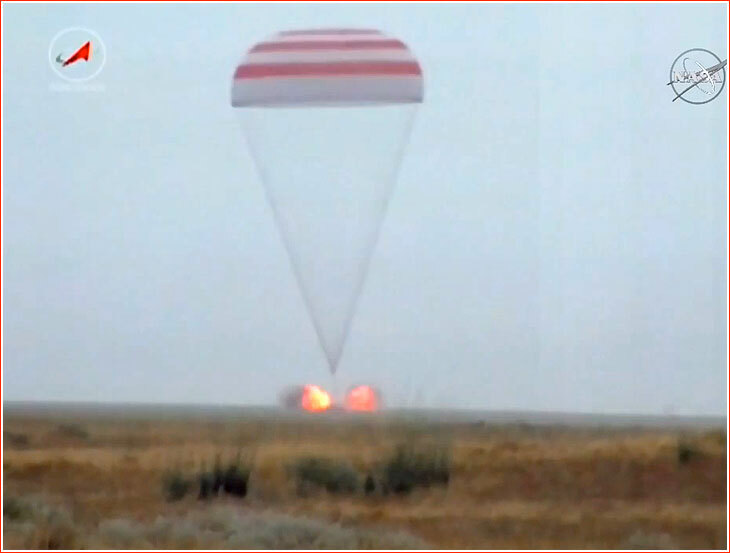 It was followed by the 1,000-square meter main parachute, which braked the descent module to 7.8 meters per second. The descent module made a very accurate landing at 8:51:36 p.m. EDT (just 16 seconds after predicted time) on September 11, 2015, (03:51 Moscow Time on September 12), 146 kilometers from the town of Dzhezkazgan in Kazakhstan. The touchdown was timed two minutes before local sunrise, to give rescue services maximum daylight time for recovery operations. The descent module was found on its side after the touchdown but the crew was in perfect shape after the extraction from the capsule. After landing, the crew paid a brief visit to the Kazakh capital of Ostana for official greetings by the Kazakh president Nursultan Nazarbaev, to celebrate the return of the Kazakh cosmonaut Aidyn Aimbetov back to Earth.